I'd like to create a metadata report to see how many users have access to the particular content folder. 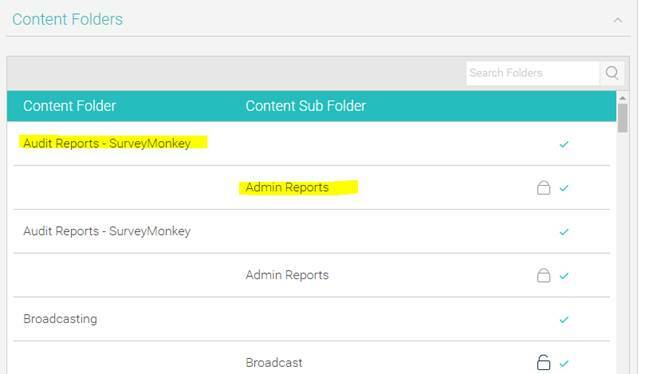 I noticed that the category and sub-category name under Report table is different from what is displayed in Admin console. Could you please advise where to find the correct category/ sub-category name in yf db? Thanks for reaching out with your question. I'll start by iterating that directly querying the Yellowfin Configuration Database can result in permanent data loss. I recommend having full backups of both your Yellowfin Config DB and your Yellowfin Install folder before running any queries directly against the YF Config DB, as doing so is not supported. That being said, you can find the you can find the Database values of category / subcategory folders in the "ContentManagement" table under "ContentTypeCode" and "ContentCode" respectively. Does this help you find what you're after? Actually what I would like to find is the value that being displayed in Admin console, not the database value. E.g. I’d like to find the value exactly the same as below. The columns that you suggested are the database code as below, which is not the same with what is being displayed in admin console. It would be great if you could advise how to link the code to reportheader table as well. Subject: New Comment in "How do I map the name of Content folders?" It would appear that these values aren't stored in the Config DB as they are seen in the Admin Console. When stored in the YF Config DB, all punctuation is stripped and the names are converted to uppercase. That being said, the values represented in the "ContentCode" column in the "ContentManagement" table can be found in each record of the "ReportHeader" table under the "SubCategoryCode" column. If you wanted to link "ContentManagement" to "ReportHeader" you could join "ContentCode" on "SubCategoryCode" to create a relationship. I wanted to check in and see if the information I provided has helped you create your report. I haven't heard back for some time on this. I'm going to go ahead and mark this as Answered. If you have further questions or issues, don't hesitate to let us know.